Pet owners can spend hundreds of dollars a year in vet costs. Depending upon the age and health of your pet, some of you might pay much more than that. But even though that expert assistance is well worth it, it is possible to save a few bucks (or a lot of bucks!) when it comes to health care for your pooch or kitty. 1. Shop Around for Pet Insurance – Pet insurance can cost anywhere from $25 to $50 a month, but it can be a lifesaver for your pocketbook when it comes to expensive operations and procedures. Since pet insurance doesn’t cover pre-existing conditions, the best time to insure your pet is when they’re younger. 2. Shop Amazon for Pet Supplies – Amazon has a variety of pet products to purchase for your pet at a great price. Recently, instead of taking my cat to the vet due to constipation and spending a lot of money on an enema, etc., I used this product to help relieve her of her pain and discomfort. The tube was under $8 when I purchased it and it worked shortly after she had her first dose. My vet approved this, so make sure you call your vet to ask about using any products first to make sure the product is right for your pet. You can also find products like flea treatments, specialty pet food, and more. 3. Trim Your Pet’s Nails Yourself – Costs can add up if you get your pet’s nails trimmed professionally. Use a quality pair of pet nail clippers and trim your pet’s nails yourself. I have a temperamental calico cat and I trim her nails on a regular basis. She can be kind of squirmy so I wrap her up in a towel first and promise her favorite treats when we are finished. I have friends who recommend Soft Claws. I did try these once but I do prefer to clip my cat’s nails. 4. Spend Time Playing With Your Pet – Keep your pets healthy and active by playing (or walking) with your pet on a regular basis. You can find affordable pet toys to keep your pet entertained. 5. 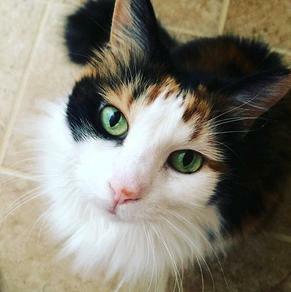 Feed Your Pet Quality Food – I once switched over to a cheap cat food for my cat, Candie (pictured below) because I wanted to save money. Big mistake. It ended up causing a lot of issues including constipation and vomiting. I had to take her to the vet and she had to stay for a day while getting treated for this. I highly recommend finding a quality pet food and sticking to it. Ask your vet for recommendations on the best food to feed your pet. We went back to a quality cat food after our vet trip from switching over to cheap food. 6. Get a Written Estimate – Imagine being told your car repairs will cost $300 and then being charged $700. The same can happen with vet bills. A written estimate can help you avoid “surprise” costs and make sure both you and the vet are on the same page when it comes to your pet’s care. 7. Get Regular Check Ups – Can you save money by going to the vet more often? You bet! Regular check ups for your pet are like yearly tune-ups for your car – they’ll help diagnose smaller problems before they become expensive bigger problems. 8. Visit During Regular Hours – Emergency visits, either after hours or during working hours but without an appointment, can be costly. If your pet is truly sick or injured, definitely take him to see the vet immediately, but if he’s merely under the weather and can wait 24 hours or so, go ahead and make an appointment. 9. Take Care of Your Pet’s Teeth – Just like humans, your pet’s teeth also have to be taken care of. There’s a variety of dental care products to use to take care of your dog or cat’s teeth including chew sticks, tarter remover sticks, water additives, oral sprays, finger toothbrushes, and more. 10. Use a Collar with a Name Tag – If your pet gets lost and isn’t chipped, he or she can get into some serious trouble and may get hurt. Invest in a personalized pet tag. That way, if someone finds your pet, they can contact you right away before your pet runs off again. This could help avoid injury and costly emergency vet visits. 11. Take Advantage of Discounts – There are all sorts of vet care discounts available to pet owners. Those cost-cutters include senior and veteran discounts, but can also be used to save money if you’re a multi-pet owner or the owner of a stray or rescued animal. 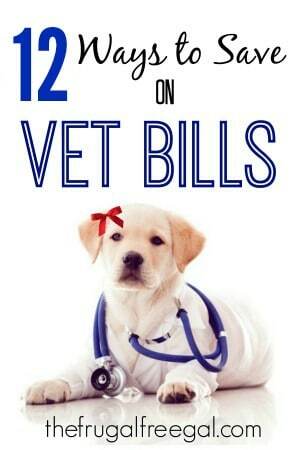 Not all vets offer discounts, but it definitely doesn’t hurt to ask! 12. Score Discounts with Pet Assure – If insurance is outside your price range, you might consider a more affordable option like Pet Assure. The plan offers a variety of pet plans based on your needs. 1. Sign up for a plan. 2. Take your Pet Assure card to any network veterinarian. 3. Receive an instant 25% discount on all in-house medical services – at every appointment! How do you save on veterinary costs? The best time to insure your pet is the day you bring him home. It will save a lot of money and heartache.an emergency vet can cost $400- to a $1000 thousand dollars just to walk in the door and stabilize your pet. Some breeds are more prone to illness.i personally have a mixbreed that at 9 months old had already cost me close to $4000 in vet bills.I would never hesitate to take him to the vet. Some policies offer preventive care and maintenance care discounts. A year of pet insurance can be one trip to the vet for an illness or accident. I have had pet insurance for several years for my dogs. One of my dogs was diagnosed with Addison’s disease in March. My vet costs between my vet and an overnight stay at an emergency clinic to continue fluids were $1940.00. My pet ins reimbursed me $1315.00 after the remaining deductible was met. I have Embrace Pet Insurance which covers wellness and accident/illness. I have received 80-100% reimbursement on preventives and wellness. Pet insurance is the best investment I have made toward the health of my pets. Thank you for sharing this information with me! I will look into this pet insurance and may add it on a future update.